"Text Mining is the discovery by computer of new, previously unknown information, by automatically extracting and relating information from different written resources, to reveal otherwise "hidden" meanings." How does Text Mining work? Text mining extracts precise information based on much more than just keywords. Instead, you search for entities or concepts, relationships, phrases, sentences – even numerical information in context. 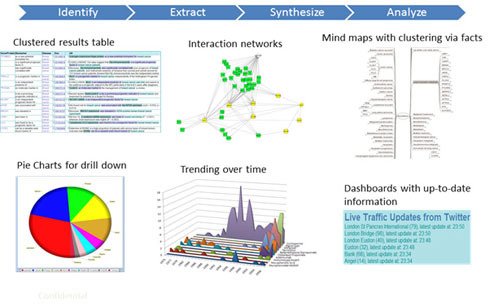 Text mining software tools often use computational algorithms based on Natural Language Processing, or NLP, to enable a computer to "read" and analyze textual information. NLP interprets the meaning of the text and identifies, extracts, synthesizes and analyzes relevant facts and relationships that directly answer your question. Text can be mined in a systematic, comprehensive and reproducible way, and business critical information can be captured and harvested automatically. Powerful NLP-based queries can be run in real time across millions of documents. These can be pre-written queries provided by Linguamatics, or queries created and refined, on-the-fly, by you. Using linguistic and other wildcards, you can ask open questions without even having to know the keywords for which you're looking. You still get back high quality, structured results. "A key element is the linking together of the extracted information to form new facts or new hypotheses to be explored further by more conventional means of experimentation." You can plug in any vocabularies or thesauri to take advantage of terminology used in your own specific area of interest. I2E text mining software works for any available textual content. Whatever the content, I2E can mine and extract with precision, whether the source data is scientific literature or social media. Why is Text Mining so important? Linguamatics' I2E text mining platform enables better, faster support for decision-making, through more effective and productive knowledge discovery. It's being used right now to solve high-value knowledge discovery problems in many different application areas. Examples are R&D, competitive intelligence, patent analysis and market research using sentiment analysis and social media mining. Because the results are structured, like information in a database, you can visualize them in many different ways: html tables, interaction networks, mind maps, charts, and so on. And it's a great productivity tool. According to customers, I2E gets to actionable results at least 10 times faster than a traditional keyword search. In many cases, I2E will produce successful results for projects that would otherwise be impossible or intractable. I2E is used widely by knowledge-driven organizations, large and small, including seventeen of the top twenty global pharmaceutical companies and many more besides. Actionable information extracted using I2E can be presented in a variety of ways depending on your needs. It can also be integrated with other information in structured databases, or via SharePoint and other portals. "The first thing that captured our attention was Linguamatics’ flexibility and support for analyzing and correctly interpreting completely new research questions and producing accurate results … excellent linguistic processing and terminology disambiguation."